Do you have an old deep cycle battery? Hopefully, you haven’t thrown away the old battery yet because there’s still a way to make use of it. Here, we’ll teach you how to recondition deep cycle batteries, so you don’t have to buy a new one. It’s very easy to do, and anyone can do it. 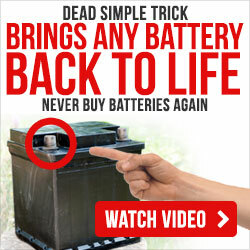 After reading this article, you will feel more confident at reviving your old battery back to life. Let’s begin! ・Clean the battery – As the batteries are used for some time, they start to corrode. There is a white powder that can be seen on the exterior which is toxic. Make sure that this is cleaned before doing anything. The safety should be the priority, and thus gloves, disposable mask, and eye protection should all be in place. Remove the battery terminals and the battery should be cleaned with a toothbrush and soap solution. Remember to lubricate with petroleum jelly or commercial protection spray. ・Take off the cell covers – After cleaning the battery, it is time to refurbish it. With the help of a screwdriver, the battery covers should be removed. The safety gears should be on as the battery contains acid. A clean cloth should be kept handy as no debris should go inside the battery. ・Fill the cell with water – The battery should be filled with fresh distilled water. The tap water is not a good idea as it is not clean and can lead to corrosion of the battery. Make use of a funnel to fill the water and avoid spilling or overfilling. The size of the battery will decide how much water will go in it and the water should be supplied just to the desired level. ・Use of radiant energy battery rejuvenator – Charge the battery to provide it power. When the battery plates are spoiled due to the sulfate build up, it will require a charger to revive the lost energy. With this rejuvenator, the battery is restored and gets charged again. The battery plates should be carefully observed and if they are severely damaged then many times recharging will be required. ・Test the battery’s voltage – The voltmeter will be required to test the voltage of the battery. The battery should be left for a few days after the recharge, and the recharge level should be rechecked. If the same amount of volt is displayed, then it means that the battery has been revived. Install the battery now, and it is advised that the voltage is continuously checked from time to time even when in use. The batteries can be refurbished even when they are left for a long period. This can even be converted into a profession you have spare time at hand and is looking for some extra activity by the side. You have to be patient when doing this process. It is not a continuous 4 hour kind of activity. The time is important, and one should not try to speed up the whole process as this may be risky. The safety gears should be used all the time, and it should be quality equipment so that the risk is minimized. Make sure that the deep cycle battery is not leaking or creating any troubles while reconditioning it. Get familiar with the steps above. If you are unsure, just go back to the steps and follow them carefully. If you want to know more about other methods on how to recondition a deep cycle battery, just send over your email so I can send you more information about it. Thank you for visiting https://howtoreconditionbatteries.org/. Please let us know if you have any questions about the method of rejuvenating deep cycle batteries.